If you have already signed the petition, now send a message to the Heads of State by email or social media. 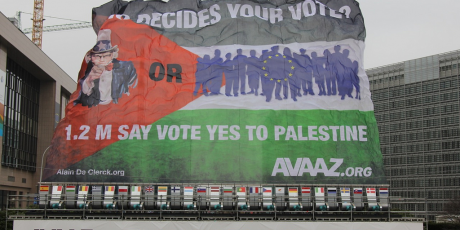 In hours, the UN will face a historic vote on Palestinian statehood. While extremists in Israel and Gaza killed civilians on both sides last week, responsible leaders backed this peace initiative, and it needs our help to win. UN recognition of Palestine could help end 40 years of repression and lead to two states -- Israel and Palestine -- living in peace and security side by side. 1.6 million of us have signed on and helped get over 100 countries to support the bid! But Israel's far-right government is lobbying hard and many countries are still on the fence. Heads of state are deciding right now. Our petition is already being widely covered in the media and delivered through actions like a 4 storey-high flag (above) in front of key government buildings. Sign and let's get to 2 million voices for a freedom and peace that the Palestinian people have not known for a generation! As a concerned citizen, I urge you to stand on the right side of history in the face of Israeli and US pressure, and support the Palestinian resolution at United Nations General Assembly. It is the best path to peace and freedom and the public wants it. Now is the time for Palestine.